As if the rule of staying inside the Earther's settlements wasn't hard enough to follow, Quinn's coincidental encounter with a Fosaanian girl named Mira in his family's kitchen stealing food leaves him breaking another rule of non-engagement with the people of Fosaan. Quinn encourages Mira to stay by giving her food and whatever else she needs for her sister. 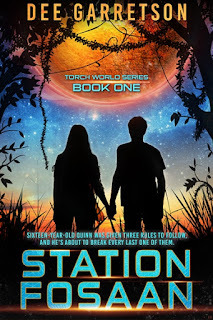 Before he can get to know her better the scientists, who are in orbit in their labs, are taken captive leaving the teens and the younger children alone on the planet with no communication to deal with the problem. To top it off, the Fosaanians accuse the Earthers of intentionally setting of the volcanoes that wrecked havoc on their planet nearly three hundred years ago. Not only does Quinn have to convince Mira to trust him, he must convince the teens and children to work together to overpower the space raiders who want to destroy them. Plenty of action and great characters blend to create a solid young adult sci-fi novel. A talking parrot adds some humor to the dialogue that naturally flows well. Author Dee Garretson successfully uses description to build a world easy to visualize for teens and tweens.